Sony Xperia L2 retains the Xperia design language we are all familiar with. It is neither classy nor ugly, just practical. The body features plastic, but you can expect that to be durable. The device is slightly thicker than the other new Xperia phones, but lighter than the Xperia XA2 Ultra. Sony Xperia L2 has a larger screen, compared to the Xperia XA2. But expect images to be less sharp with a resolution of 1,280 x 720 pixels. The primary shooter on the Sony Xperia L2 has a resolution of 13 megapixels. You may expect decent performance from this one when capturing images, but don’t anticipate too much. The Sony Xperia L2 looks like a great one for taking selfies with friends. It has an 8MP front facing snapper with a 120-degree wide-angle lens. With this, you can capture more people in your shots. Equipped with a MediaTek MT6737T processor, the Sony Xperia L2 definitely can’t match its more expensive siblings in performance. But decent multitasking looks feasible with the provision of 3GB RAM. Highly graphics intensive games may not run as smoothly, though. Internal storage is 32 GB and it is also expandable by up to 256 GB via a microSD card slot. You may be disappointed somewhat that this one still boots Android 7.0 Nougat OS. 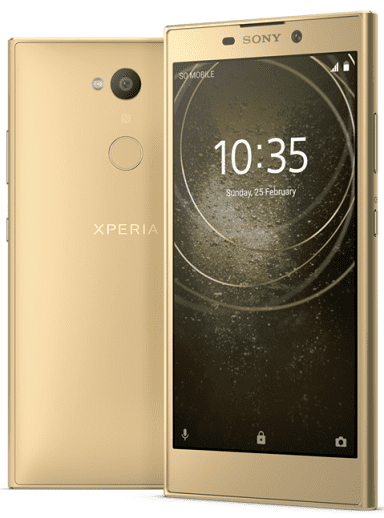 Like the Xperia XA2 and its Ultra variant, this phone offers you a rear-mounted fingerprint sensor. It comes with a similar capacity 3,300 mAh battery as the former. There is Qnovo Adaptive Charging tech for monitoring the health of the battery and prolonging its lifespan. The Xperia L2 will be available in both single and double SIM variants. It supports 4G LTE connectivity. There is reversible USB Type-C and NFC among its connectivity features. Sony Xperia L2 is not yet available in Nigeria, but the smartphone is now available for pre-order on BestBuy.com for $250. It is expected that the Sony Xperia L2 will begin its global launch on February 16, 2018. We currently have no data on pricing and availability for Nigeria, Ghana, and Kenya. When available, Sony Xperia L2 Price in Nigeria is expected to range from 90,000 Naira to 150,000 Naira depending on your location in the country.